Table top game that plays like a retro sidescroller! Super Hazard Quest is a “board” game inspired by the classic age of video game side-scrollers. 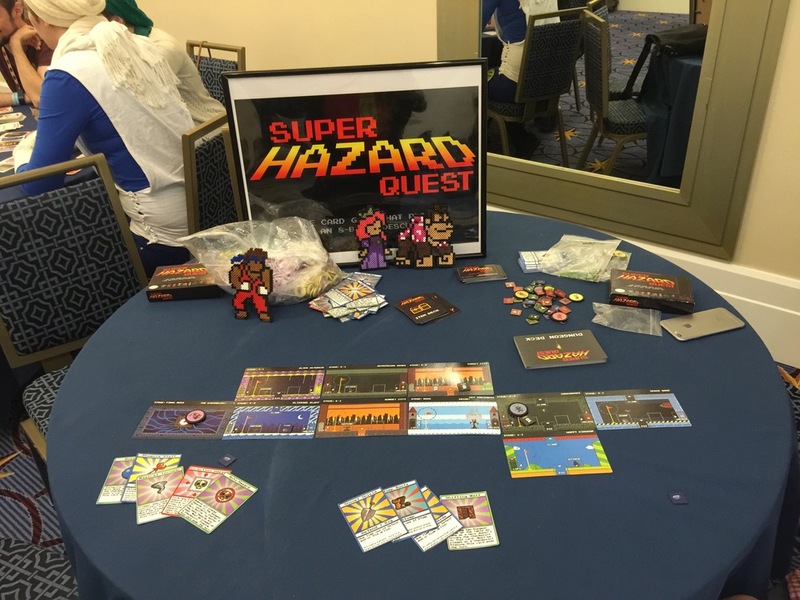 While 8bit art and retro inspired card games continue to be a common theme in the world of tabletop gaming, Super Hazard Quest not only references classic video games, it plays like them too. Heroes build and explore an ever-changing, randomly generated level. Along their adventure, they’ll discover items, tackle enemies and beat bosses. But their most dangerous threat are other heroes. Who will be the first player to beat the final boss and take the glory? It’s all the fun of multi-player retro gaming without ever having to blow into a cartridge. Thanks for everyone who helped to make #‎MAGFEST so awesome for us!!! You really know how to have a great time!!! From some old school Street Fights to Two Rooms and Boom. Looking forward to partying with ya'll next year!!! Super Hazard Quest is at PAX East!!!! !